Christmas and New Years are over, it’s a mere 45 degrees here in Arizona and we even had a light dusting of snow last night! 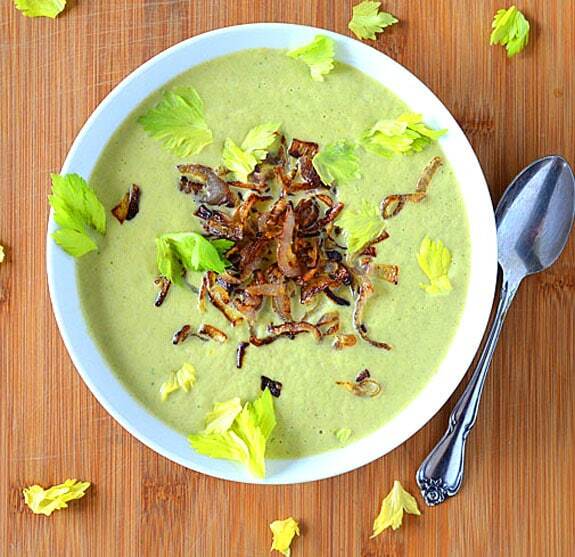 It’s cold, we ate way too much over the holidays and this Healthy Vegan Cream of Celery Soup hit the spot. Its mild, light and creamy. We topped it with homemade crispy fried shallots, but you could certainly omit them if you prefer. Garnish with a few celery leaves and serve hot. 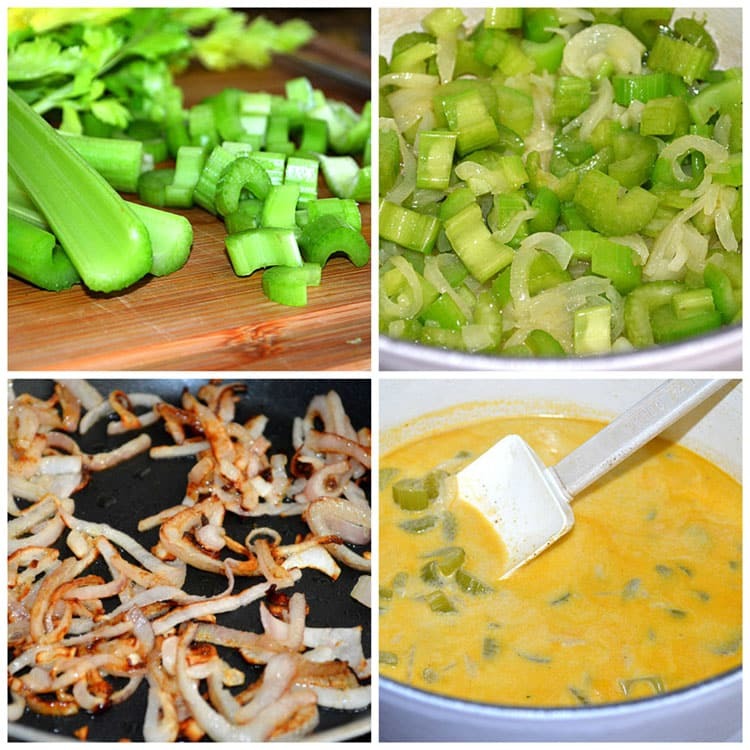 In a large stock pot, we sauteed the chopped onion and celery in a small amount of oil. If you can find celery root, you could add one small one to this recipe. I had a difficult time locating it at my store however. If you’d like a thicker consistency for your soup, go ahead and add 1 small diced potato at this point. While the celery is cooking, we added about 1 tsp of oil to a fry pan and added the sliced shallots. They take just a short time to turn golden. Drain on paper towels and allow to dry so they become crispy. To the now tender celery, we added vegetable broth, water, celery salt and 1 small bay leaf. We let this boil for about 10 minutes and allow to come to a simmer. 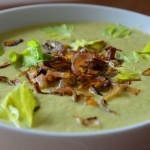 To finish off the soup, add either 1/2 C coconut or Almond milk creamer, or canned coconut milk. Simmer for 10 minutes. 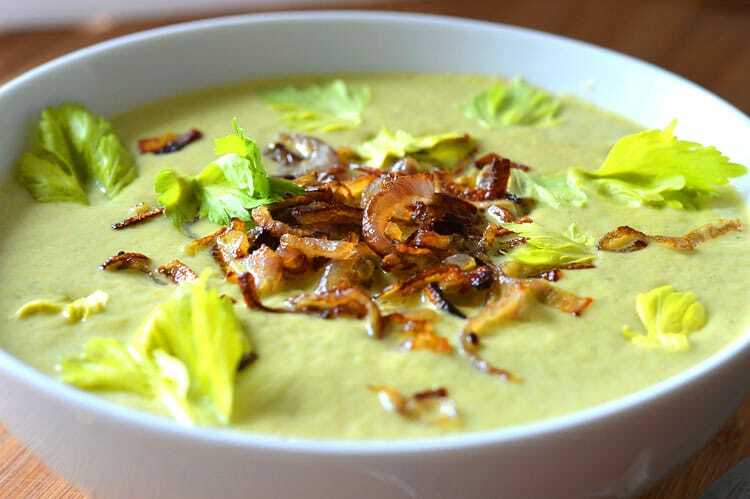 Allow the soup to cool slightly, remove the bay leaf, add the chopped herbs and in small batches, puree in a high-powered blender or food processor until smooth. Take care that the soup is not too hot, nor the blender too full as it will expand as it blends. It’s best to do a cup a time. Top with the crispy fried shallots and fresh celery leaves, if desired. In a large stock pot, add the margarine and oil to a hot pan. Add onions and celery, (If you are adding celery root and/or a potato, this would be the point where you would add them), sauteeing until tender. About 8-10 minutes. Meanwhile, in a small skillet, add 1 tsp of oil and the shallot. Fry until tender and golden. Remove to a paper towel, blotting and allowing to dry until they become crispy. Reduce heat to simmer and add the creamer or coconut milk. Cook for another 10 minutes. Cool, remove the bay leaf and add the herbs before pureeing in a blender or food processor. Hot liquids will expand and force the lid off of the blender. It is best to cool and puree in 1 C batches. Place pureed mixture back into the pan to heat through. Top with the crispy fried shallots and celery leaves, if desired. « The Top 10 Recipes of 2014! Ahhhh what part of Arizona?!?! I just moved from Scottsdale at the end of October and spent the past 12 years in Scottsdale. There’s not even snow here in Milwaukee and my family and friends were sending me photos of the snow. I miss those mountains! Yes, I know those areas all too well! I love when the mountains get snow but it is still clear skies and super sunny. I can’t wait to go back and visit and I’ve only been gone a few months! Hopefully you enjoy it out there. When did you move? I moved here in 1997 and then went back east in 2000. I missed it so much, I came back in 2003 and have been here ever since! I do love it here. You can’t beat the weather, but I really long to be near the ocean someday. P.S. Thank you SO much for sharing my recipe in your Link Love this week 🙂 I really appreciate it! At what point do you add the parsley? Hi Robin, sorry about that. I had written it in the blog text but didn’t elaborate in the printable recipe itself. I just updated it but you’ll want to cool the soup before blending and at that point, remove the bay leaf and add the herbs such as parsley. You could also add any additional fresh herbs that you enjoy. Thank you Aimee. I made the soup tonight and it was delicious! I live in Tucson – hey neighbor! I have lived here for about 16 years. We mainly get snow in the mountains, not in the city. This recipe is not only beautiful, but looks delicious as well!